Powerful next generation gaming console, beautiful design and system performance, graphic UI is neat and clean but still need to to have more new features & games to fully utilized this next-gen console. Overall its Rocks! 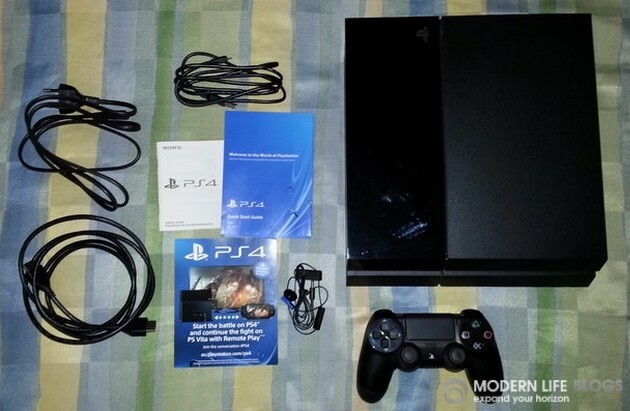 Sony PlayStation 4 is the most powerful gaming console on the planet. Graphical power and 32 times more system memory than the PS3, focus on pure gaming experiences rather than media, it has established itself as the next-gen console to beat all gaming devices. It’s a games console built by gamers for gamers. Launched in India on 6th, January 2014, at the price of Rs. 39,990 although the price is quiet high from previous gaming console PS3. Then also it drive craze to indian gamers and most of the suppliers don’t have stocks left within the week of its launched. PS4 equipped with an 8-core AMD Jaguar CPU, clocked up to 2.75GHz. This is paired with an 800MHz AMD Radeon GPU and a healthy 8GB of GDDR5 RAM. Its got 10 times the power of the PS3. On its face is a slit of a mouth, a slot loading Blu-ray disc drive. To its right are two powered USB 3.0 ports, which can charge your DualShock 4controllers when the system is turned off. Two USB ports are the PS4’s only front facing connections. In the rear you’ll find HDMI, Ethernet, a digital optical audio out and a proprietary auxiliary connection for the PlayStation Camera. For wireless connections, the PS4 uses 802.11 b/g/n for WiFi and Bluetooth 2.1 for its wireless DualShock 4 controllers. You can even change your location with a DNS on your PS4 with a VPN service. The PlayStation 4’s DualShock 4 controller is Sony’s best yet. It’s compact, light and ergonomically sound. Share and stream your epic triumphs. DualShock 4 controller have share button so you may share your great screenshot on Facebook and Twitter, you can stream live gameplay for others to watch over Twitch and Ustream. New additions are the touch sensitive trackpad (yet to be put to good use) in the middle and integrated coloured ‘Move’-style light which can be used with the PlayStation Camera. It is also supplied with a mono headset so you can challenge your friends via cross-game chat. 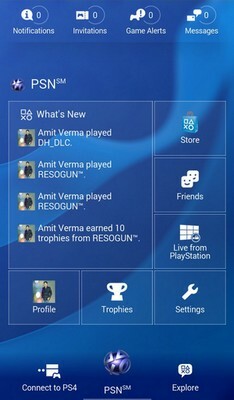 · see what your friends are playing, compare trophies and view your profile or recent activity. · chat with your friends, receive notifications, game alerts and invitations, then use your mobile device as an on-screen keyboard for your PS4™ system. · browse PlayStation®Store, pick up the latest hit games and add-ons, then push them to your PS4™ system so they are ready when you get home. · take advantage of the in-app second-screen features (when available) for greater challenges and control. PS4 is for games, it’s a bit disappointing that lack of games at launch. 20 games available but the vast and overwhelming majority of these are available for older consoles (like PS3 and XBox 360) and platforms – they’re not next-gen games. Examples include FIFA 14 and Assassins Creed 4: Black Flag. Handful of exclusive games: Knack, Resogun, Contrast, Warframe, Need for Speed: Rivals & Killzone Shadow Fall. Properly next-generation games will take developers a while to launch so we won’t see any until next year. We are eagerly awaiting next-gen games like Infamous Second Son, Drive Club, Thief & more as on sony ps4 website says, The best selection of PlayStation 4 games, with over 180 titles in development. Check out gameplay of some great games we recorded via PS4 while playing. Looks great, I loved the videos. I’m thinking the PS 4 will be a big hit, keeping its competitors on their toes! Yep, agree with your comment Carolyn PS4 will be great hit but they have to bring more gaming titles so that gamers enjoy this great gaming console. Hope in coming months we able to see more games. InFamous – Second Son is awesome game with great graphics waiting for its lauch.